After the police took delivery of their new 32’ Boston Whaler boat, the Bermuda Sloop collided with the police boat, resulting in the vessel suffering cosmetic damage to its fluorescent wrap on the starboard side. 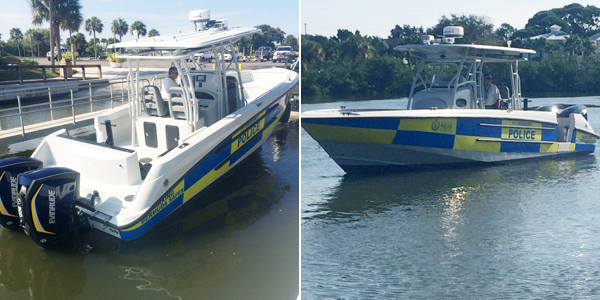 A police spokesperson said, “Last week Thursday [Oct 1st] the BPS took delivery of the new 32’ Boston Whaler Justice. Later that same day whilst the BPS boat was secured to its dock, the Bermuda Sloop entered Dockyard. “The Captain of the Bermuda Sloop lost control of his vessel in the Dockyard camber in high winds and his boat collided with the BPS boat. There was no damage to the Bermuda Sloop. “The BPS vessel suffered damage to its fluorescent wrap on the starboard side. No hull damage was suffered. The damage caused is cosmetic and we are currently weighing up options to rectify it. “Also presently Police Week is in full swing with the Police Open Houses taking place at the respective police stations today from 10am until 3pm at Hamilton, Southside and Dockyard. Just bought the thing! DING INNA DE HULL…DAAAANG!!!! Can’t make this stuff up. I ask a question and get 3 dislikes? Take it easy on Terry, a new resident. Must be the left over rum from Joiquen. I figured it was but you know how it is when people have nothing else to do except piss people off. Which you do quite well. Ah, the irritating fool of the Bernews comments section shows his true colours! The sloop is the Spirit of Bermuda. That thing is heavy, so it could have been so much worse. Doo Doo happens. It was really windy that afternoon. Accidents do happen. That comment is a little unfair as a parent of someone on board I can assure you that it was an accident. Conditions were tough. Given the 88 ton 112 ft single engine vessel lost use of it’s already very inadequate bow thruster during the docking maneuver. The Police Vessel is parked very close to the Spirit of Bermuda’s Berth, so in high winds, you can imagine their surprise when a the Police boat that is not normally there is a couple yards away from where they normally perform their docking maneuver, no surprise it got grazed! And in the wind thats was a terrible place to put a barand new boat. It is a dock. Who cares what boat was there!!! !not like the whaler is any wider than the police inflatable!! Maybe the captain should have stood down and waited until the conditions improved. Its his fault no matter how you cut it. The boat is heavy and from experience as a guest on the Sloop twice the ship is very heavy and hard to manouver. The crew are great. Why wasn’t the Spirit being assisted by a tug if conditions were so bad?? But under those conditions a tug would not have been helpful due to it’s size and ability to mannouver in such tight quarters. A smaller vessel would have worked with a good crew. The Marine police won’t have to worry about getting seasick for a few days.